One of the questions that I’m asked repeatedly, especially during trade shows, is what is the cost of using a lighted stair nosing. It’s true that most commercial installations do not require or need the option of lighting, but in those circumstances where it is needed, it’s sometimes hard to find and can be quite expensive. Before you decide which lighted stair nosing to purchase, make sure you’ve looked at all of your options. Most of the lighted stair nosings available on the market are made from either aluminum or PVC. The aluminum profiles can be anodised to just about any color to match the decor. The PVC profiles can be clear so that the lighting can be seen from more than more direction. The cost of the basic stair nosing profile is fairly similar in both aluminum and PVC. The stair nosing alone can run between $7.00 a foot and over $20.00 a foot, depending on the shape, size and manufacturer. When you add an anodised color to the aluminum, it increases the price. The highest cost associated with a lighted stair nosing is typically with the LED strips. 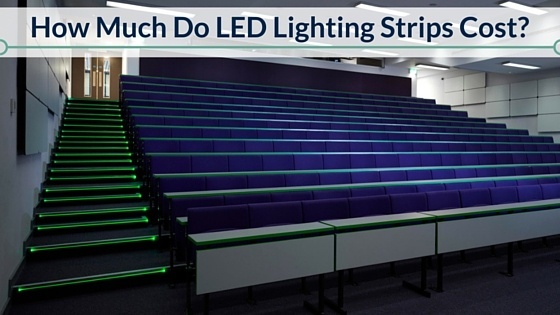 The cost of the strips can vary depending on the length of the strips, the number of LEDs per strip, and the color of the LEDs. Some lighted stair nosings come complete (all components at one price) but some are sold per component. If you’re purchasing a stair nosing system that is complete, your cost will probably start at $35.00 per foot. When purchasing the LED strip separately, depending on color, length, etc., your cost could range from around $20.00 to over $50.00 each. Again, the components that you need may or may not be included in the total cost of your lighting stair nosing. Some parts that you may need include a carrier tube that will secure and protect the LED strip, end caps for the end of the stair, and backing plates to protect the step if you’re using a PVC stair nosing. The costs for these components would not be excessive, but should be considered. Carrier tubes and backing plates shouldn’t cost more than $2.00 per foot each and the end caps should be $5.00 or less each. The number of connectors that you will need will depend on how the stairs are being connected to the power source and how many steps you have. One good rule of thumb is to allocate $20.00 per step for special connectors. Of course, if you are having the stair nosings installed by an electrician, they may be able to use their own wiring and would not require special connectors.